Bodybuilding is a contest of physiques, but the mind rules the body. Learn how Branch, Phil and other pro bodybuilders mentally prepare for battle. Phil Heath and Branch Warren will be flexing onstage for supremacy at this year's Mr. Olympia, but the battle may be won or lost between the ears. Willpower, determination, gamesmanship, and discipline are all derived from the mind. The body just does their bidding. More than 30 years ago, the bodybuilding world caught one of the biggest insights into the mind of a champion it would ever see. Flashback to Pumping Iron, starring Arnold as "King of the Hill" and the reigning five-time Mr. Olympia winner; and Lou Ferrigno, who was the reigning Mr. Universe and No. 1 contender for the Olympia title. They were to clash at the 1975 Mr. Olympia in Pretoria, South Africa. 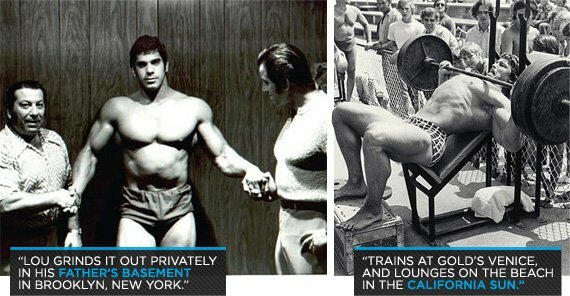 Throughout the movie Arnold trains at Gold's Venice, and lounges on the beach in the California sun. Across the nation, in Brooklyn, Lou grinds it out in a basement. His father yells, "Arnold! Arnold! Arnold," as Lou bangs out rep after rep of military presses. "I want to beat him!" Lou screams in reply. In South Africa, Arnold and Lou meet on screen for the first time. Arnold goofs around, playing mind games with the younger, less-experienced Ferrigno. Arnold goes so far as to tell Lou that he has already called his mother to tell her he has his sixth Olympia. Arnold continues the head game right up to the end of the contest, even leaning over to Lou whispering something in his ear right before Lou was called in at third place. Now it's 2012, and with the 48th Annual Mr. Olympia about to be contested, the bodybuilding world enjoys another classic rivalry. Reigning champion Phil "The Gift" Heath will compete against the world's most muscular bodybuilder and reigning Arnold Classic Champion, Branch Warren. The last time Branch beat Phil was in 2009, when Branch finished in second place and Phil finished in fifth. Each time these two warriors have met since, Phil was named victor. This kind of head-to-head competition can wreak havoc on an athlete's psyche. Couple this continued series of defeats with Branch's leg injury, which kept him out of last year's Olympia, and you have a recipe for doubt. A lesser athlete may have decided to call it quits. Quit? Branch did not quit; hell no, he did not. He came back better than ever and took home the 2012 Arnold Classic title, inserting him as the top contender for the 2012 Mr. Olympia, September 27-29, 2012 in Las Vegas. I spoke with Phil recently regarding his victory and how being the reigning Mr. Olympia will affect his preparation for this contest. His response was not hyped up as Arnold's attitude in Pumping Iron, like I had expected. It was neither cocky nor egotistical. It was very self-aware. He was reassured by his dominance in last year's contest and of the advantage he has going into the 2012 Mr. Olympia. He was not worried about any one athlete dethroning him, but simply with winning the Olympia title for the second time. This conversation was similar to one I had a few years back with a six-time Olympia winner, Dorian Yates. He too trained to win rather than defend the Olympia title. I sense a strong similarity in the frame of mind of the two champions from the opposite sides of the world. Unlike Arnold nearly 40 years ago, Phil Heath lets his physique to do the talking, a more subtle and elegant form of mental intimidation. However, "The Gift" faces a different breed of challenger than Arnold did. Branch Warren is a man who, against the odds, returned after a torn quadriceps tendon to win Arnold's own Classic in 2012. Neither man needs to psych out his competition. Both men feel they are legitimately the world's best. This weekend, we discover who is right.